Filed under raspberrypi on May 25, 2016. The Raspberry Pi’s operating system (OS) is a modified version of the open source (free) Debian Linux distribution. Debian includes a package (software) manager know as the advanced packaging tool, or apt. A subset of apt is the command apt-get. We use this command to update our Raspberry Pi’s OS and software. To apply updates, the Raspberry Pi must have the Raspian OS installed and an Internet connection. I’ll begin with the commands and timeframe to apply updates. After a quick review of the commands, I offer more detail about the function of each command. Let’s dive right into the commands we use to keep our Raspberry Pi up to date and how often to use these commands. The update frequency is a matter of preference; however, I recommend the following. There are graphical user interface (GUI) tools available that assist with updates; however, using Terminal commands provides a deeper understanding of how these GUI tools work and provides an introduction to the use of console commands to manage the Raspberry Pi. Let’s discuss each command and learn how to update the firmware. The Raspberry Pi firmware allows the hardware to communicate with the software. On a full size PC, the firmware normally resides on an integrated circuit on the motherboard. On the Raspberry Pi, the firmware resides on an area (partition) of the SD card. This configuration allows firmware updates to be simple and reduces hardware costs. 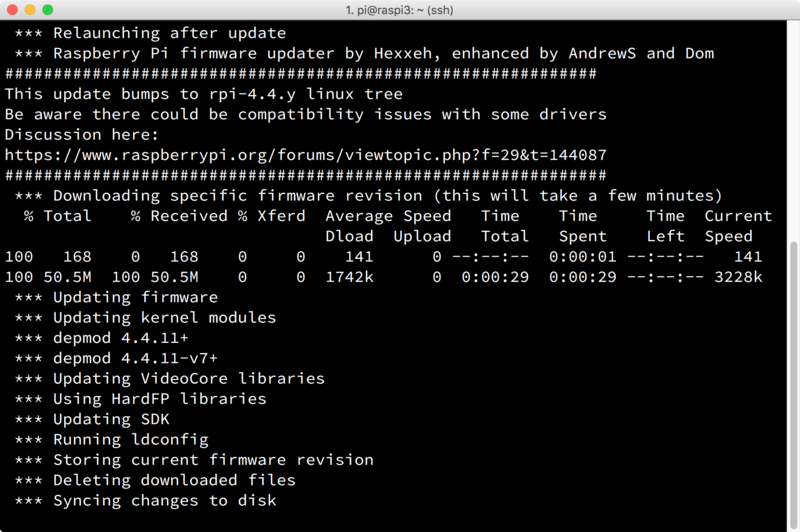 The latest version of the Raspberry Pi firmware will download and update the Raspberry Pi OS kernel as shown in the image below. See the official rpi-update page for more information about firmware updates. Do not use this command if you have made modifications to your kernel to support additional hardware, such as the GPIO connected PiTFT display from Adafruit as shown in the image below. Doing so will most likely require a kernel rebuild. If you didn’t understand that statement, you probably don’t need to heed this warning. The apt update option connects the Raspberry Pi to the online software repository database and compares available software to installed software. From this comparison, apt develops a list of packages that need an update. It may take up to a minute or two for the update to finish. After the repository updates, the Raspberry Pi can now determine what Raspian OS and software updates are available. Updates often contain security enhancements and software feature additions. It is always good practice to use this command before you use upgrade commands. The Raspberry Pi will display a list of the updates. I recommend using the dist-upgrade option. To me, it just makes sense to update both the OS and all software on the Raspberry Pi. After upgrades, it’s good practice to execute the apt clean option. This will recover additional space on the SD card. During the installation process, apt downloads .deb files. These are installation files that are no longer needed once the application is installed. Removing them will free space on your SD card. This is especially valuable if you use a 4Gb SD card. Regular Raspberry Pi updates will ensure the Pi has the latest security improvements, application and OS features. The task is simple once you understand and use the commands on a regular basis.